Between GFC followers and e-mail subscribers, Snuggly Oranges hit 200 followers this month, right around the new year! I honestly can’t believe it, and I want to thank all of you. Now a lot of thanks goes out to Cuddlebuggery for their awesome giveaway bloghop, which definitely contributed a lot to this number. But I never expected that I would reach this milestone when I only started this blog at the end of October. It’s really exciting to get feedback from people, that they like my reviews, and it just makes me blush every time. So thanks. I really wanted to do something nice to thank all of you. And Christmas brought a happy coincidence. 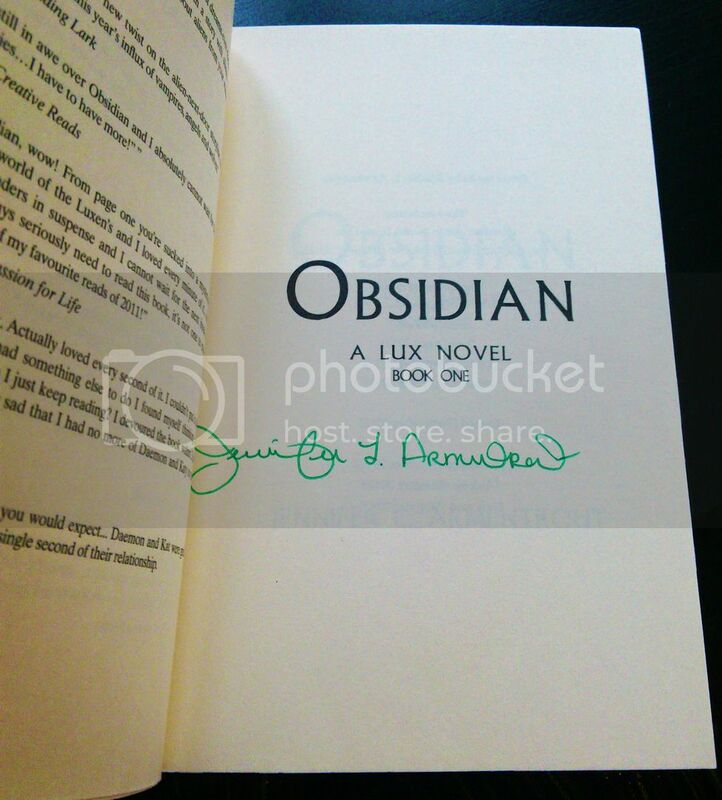 Somewhere along the way, between a giveaway I won, another blogger’s kindness, and my mother ignoring my wishlist (or rather, what WASN’T on that wishlist), I ended up with THREE signed copies of Obsidian by Jennifer L. Armentrout. Unacceptable, I know, M-O. But that means I can offer a wonderful prize!! But that’s not where it ends for JLA fans. The giveaway I won also left me with a ton of spare bookmarks, which I’d love to share with you all too and use to spread the JLA love. (And after all, I wanted to be able to give something to more than 1 person, because it’s 200 people I’d really like to thank!!!) I have 2 packs of Lux bookmarks (old Obsidian design, new Obsidian design, Onyx, and Opal), 1 pack of Covenant bookmarks (Daimon, Half-Blood, Pure, Deity), 1 Pure bookmark, and 13 Daimon bookmarks. So in total this giveaway will have 18 winners! This giveaway runs until February 9th, at 11:59 p.m. EST. When the contest ends, the 18 winners will be announced here and emailed. The winners will have 48 hours to respond, before another winner is picked. I am not responsible for items lost or damaged in the mail. Congrats on 200 followers ! I love Jennifer’s Books! I came across your blog from Opal review (random googling actually). I’ve just finished Onyx yesterday and can’t resist to start Opal already. Your review had some spoilers but it didn’t make me stop to read the actual book. It made me moreeee excited!! I love Jennifer’s writing style sooooooo much. I bought the Lux series (the ebooks version) but I’m planning to read Covenant series hopefully soon after I finish Opal. WHY? cause it’s Jennifer’s book = AWESOMENESS. Hahaha, thanks! I’m glad there’s another huge JLA fan here. I also still need to read the Covenant series, but it’s definitely high on my list. 🙂 Thank you for being so sweet! Thank you! I wish you the best of luck! I love all the books by jen but I only have the e-books so it would be nice to have it in print. I have heard some really good things about this book! You’re welcome 😀 Sharing is awesome! This is my first visit to your blog (The Obsidian giveaway was the main reason- Love that series!) and I will be back! Super cute and I’m always looking for reads that I myself may never pick on my own! Way To Go on your 200 followers. Super Giveaway Thank You!! Super cool. This is one of the series that I see all over the place, but I haven’t taken time to read it yet. Maybe this year’s my year! My friend cant stop ranting about this book. I simply had to enter. Thank you. Haha, awesome! You’re welcome, and good luck! Thank you for this giveaway! I wanted to read this book for a long. You’re welcome! I hope you do read it even if you don’t win, but good luck! Aww, you’re welcome! Good luck! Looks like you are doing really well with so many followers and only blogging for a few months! Congrats!